Baeckea imbricata (Heathmyrtle) at a nursery. A year ago I came across a curious plant in a nursery, Baeckea imbricata(Heathmyrtle). 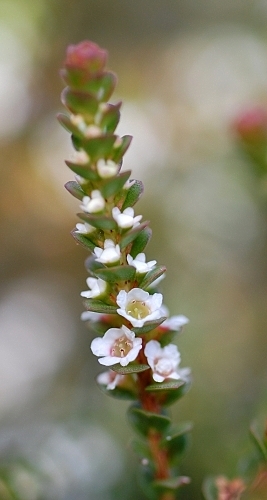 It had somewhat small fleshy oval leaves with compact Leptospermum (Tea-tree)-like flowers tucked in the leaf axils. The plant was labeled as a Tasmanian native, which intrigued me. Till that point I was rather certain that only two species of Baeckea occurred naturally in Tasmania. 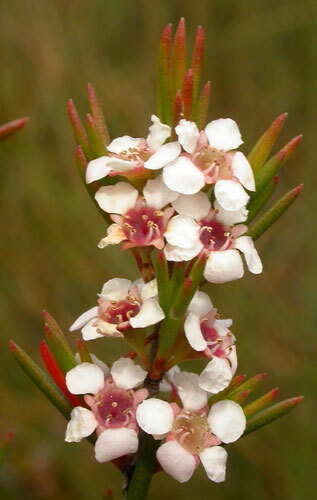 Baeckea gunniana, the Alpine Heathmyrtle, is one of these. A neat and compact species of upland areas, B. gunniana is often found scrambling over rocks. The other species is Baeckea leptocaulis, the Slender Heathmyrtle. This is an endemic shrub which grows in buttongrass sedgeland largely in the western part of the state. There had previously been a third Baeckea, B. ramosisima, which was later transfered to a genus of it’s own called Euryomyrtus. 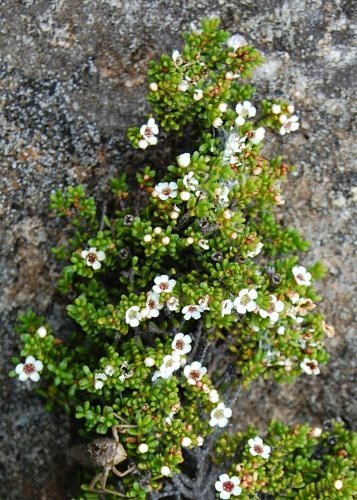 Baeckea gunniana (Alpine myrtleheath), Mt Field. The Vascular Plant Census does not include B. imbricata, neither does the Key to the Tasmanian Plants. Yet, it was highly unlikely that the plant in the nursery was mislabeled as the professionalism and knowledge of the nursery owner is not in doubt. I didn’t get to ask the nursery owner about the issue then. Eventually, the building pressure of my curiosity left me no other recourse but to go to the source – a taxonomic work of Baeckea, of which I used A.R Bean’s 1998 Revision of Baeckea (Myrtaceae) in eastern Australia, Malesia and south-east Asia. Bean’s work on Baeckea is available online by following this link here. The paper details that B. imbricata occurs in coastal heathy swamps and open eucalypt woodlands in New South Wales and Queensland. Baeckea leptocaulis (Slender heathmyrtle), Mt Field. As to it’s occurrence in Tasmania, it turns out that in the 1980’s a single individual of B. imbricata was found in bushland in eastern Tasmania by naturalists John and Marion Simmons. The plant was propagated by cuttings, and a specimen was taken from the cultivated plant and lodged at the Hobart Herbarium. Whether the plant still exists in the bush is questionable. According to Marion Simmons (as cited by Bean), the original plant was destroyed by fire and no plants have yet been relocated in the area. If the B. imbricata individual that the Simmons found was indeed the last one in Tasmania, it is gladdening to think that it remains tendered to in at least a few home gardens around Tasmania. Perhaps this heathmyrtle is worth looking out whilst rambling around the bushlands of the east coast, but for now it seems, B. imbricata is no longer wild in Tasmania. This entry was posted in Miscellaneous and tagged Baeckea, Baeckea gunniana, Baeckea imbricata, Baeckea leptocaulis, heathmyrtle, John Simmons, Marion Simmons, Myrtaceae. Bookmark the permalink.